Gas City, formerly known as Harrisburg, began as a "boom town" when an abundance of natural gas was found in this vicinity in 1887. 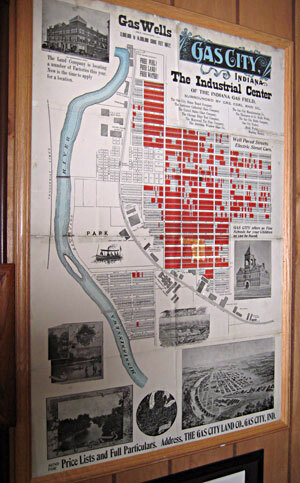 The original settlement of Harrisburg was platted May 25, 1867. Noah Harris, the founder, was born June 22, 1823 and died in August 1913. Mr. Harris was a fur trader in his early years, later becoming interested in real estate and the nursery business. Following the discovery of natural gas several officials got together and the Gas City Land Company was formed March 21, 1892, and a few days later Harrisburg changed its name to Gas City. On April 4, 1892, a Gas City post office was established. the census at that time showed the population to be 150 people. Gas City, as the name would imply, owed its start and existence to the seemingly inexhaustible supply of natural gas. Gas City was in the center of the gas fields. The pressure was from 300 to 350 pounds to the square inch, and there seemed to be an unlimited supply, so it was used lavishly. The founders of Gas City saw possibilities in this location of a town of 25,000 people. They leased all the gas under thousands of acres of land and bought about 1,200 acres of land and laid out the central portion of it as Gas City. The Gas City Land Company pledged to use the proceeds from the first sale of lots to provide free sites, gas, and water for factories, also for putting in a sewer system and laying out streets. Lots sold from $200 to well over $1,000 each and there was a wild scramble to buy them. The town seemed destined to become a metropolis. Within in three months eight factories had moved in. Thousands of people came to work in the factories and start up businesses. A bank, opera house, hotels, rows of business offices and numerous homes were quickly built. The demand was so great that many people lived in tents and shanties until their homes were built. With this boom came many attractions especially near the Mississinewa river. There was a race track near the river that attracted large crowds; a steam launch, "The Helen Boyd", gave rides on the river; and a buggy trail meandered along its banks. 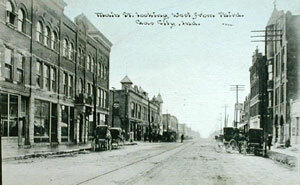 By 1900 Gas City had a Population of 3,622; almost 25 times larger than in 1890. Trains from the east arrived daily and the orphan trains also ran through town. Those were great days, and had the gas continued Gas City would no doubt have become a large city. But the apparently inexhaustible supply of natural gas ran out. One by one the factories disappeared. Some quit business and others relocated. The town was built on gas and when that disappeared the fields had to return to crops. The Gas City Land Co. was formally dissolved in 1904. Only two factories remained until the 1980's. But Gas City has survived. Though the name, Gas City, may provoke odd expressions from outsiders who know nothing about the gas boom, this is a wonderful place to live. The city has become the fastest growing city in Grant County. A new industrial park has moved in and housing additions have been built. Recent improvements have continued to make Gas City a good place to live. 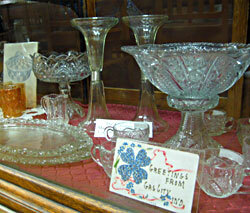 We invite you to visit the Gas City Museum to learn more about the town's history.